But the Pope‘s words are not moving Cuban authorities, who say that there be no political change on the island. Murillo’s comments to a room full of journalists covering the papal visit were a quick and categorical response to comments by the pope earlier in the day, when he made a highly symbolic prayer visit to the shrine of the nation’s patron saint. “I have entrusted to the Mother of God the future of your country, advancing along the ways of renewal and hope, for the greater good of all Cubans,” the pope said at the sanctuary in the little town of El Cobre. On the second day of his Cuban tour, the pope knelt silently before the Virgin of Charity of Cobre for several minutes, his eyes open and hands clasped. The crowned, wooden statue just over a foot (35 centimeters) tall stood on a covered table shrouded in blue and white cloth. The 84-year-old pontiff then rose with the help of two Cuban bishops, approached the statue, lit a candle and stood in prayer as a choir sang hymns. The pope pointedly referred to the Virgin by her popular name, La Mambisa, in a gesture to the many non-Catholics on the island who nonetheless venerate the statue as an Afro-Cuban deity. Mambisa is the word for the Cuban fighters who won independence from Spain at the turn of the last century. In subtle ways, the pope has acknowledged a lack of faith in what is Latin America’s least Catholic countries, and tried to make his trip appealing to potential believers. The visit is timed for the 400th anniversary of the appearance of the statue of the Virgin to two fishermen and an African slave in Cuba’s Hipe Bay. Dunia Felipillo, 45, said she was proud to see the pope praying before the Virgin of Charity, even though she herself was not Catholic. “We all ask favors of la Cachita,” she said, using the Cuban slang for the Virgin, as she watched the ceremony on TV from the lobby of a Santiago hotel. Benedict’s frequent references to the Virgin are also a way of hitting on something the church shares with Cuba’s nonreligious leaders and his wider audience, in contrast to the church’s positions on divorce and abortion, not to mention his past strong comments against Marxism. While most Cubans are nominally Catholic, fewer than 10 percent practice the faith. “I appeal to you to reinvigorate your faith … that you may strive to build a renewed and open society, a better society, one more worthy of humanity,” he said Monday at a Mass in the nearby city of Santiago. Meanwhile, dissidents on the island were trying to determine the identity of a man who yelled “Down with the Revolution! Down with the dictatorship!” before the Mass. Security agents hustled him away. Video of the incident showed him being slapped by another man wearing the uniform of a first-aid worker, before security agents separated them. The government has not commented. Benedict seemed to walk with renewed vigor Tuesday as he greeted officials and clergy after his plane arrived in Havana following a day in eastern Cuba. He had appeared exhausted the previous evening from days of traveling in Mexico. 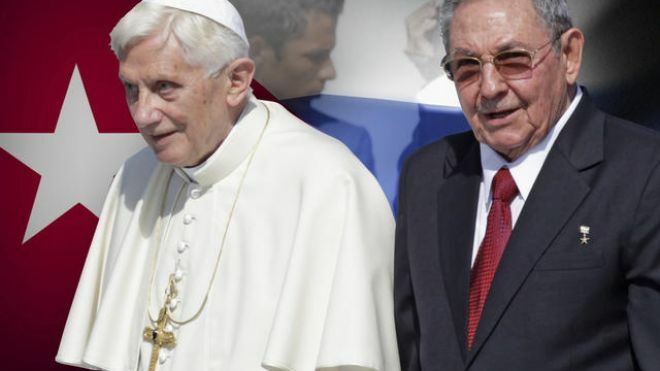 The pope was to meet with Raul Castro in the afternoon and possibly Fidel Castro, though that had not been confirmed. Venezuelan President Hugo Chavez, who is in Havana undergoing radiation therapy for cancer, did not ask for an audience but would be welcome to attend Mass in the capital’s Revolution Square on Wednesday, a Vatican spokesman said. Based on a story by The Associated Press.